Superimposing digital data on the physical world is not just for the 1%. As more of our innovators, artisans, and marketers experiment with augmented reality, the tumultuous politics of our times are beginning to follow suit. This year’s Occupy movement broke new ground in various ways that will keep sociologists and political scientists busy for decades. One example is how some of the protestors resorted to free AR apps to keep the public informed about related events and locations. Using Metaio’s location-based AR browser junaio, one AR developer launched an “Occupy channel” that provides locations, contact information, and resources for all the Occupy protests in various cities across the country. The Occupy Wall Street group in New York took this idea one step further, using junaio to superimpose signs, placards, and related imagery over areas from which they were restricted from physically protesting. A related site called “AR Occupy Wall Street” styles itself as a “call to all AR activists,” and collects a series of protest-themed images from various AR designers. Of course, the utility of these apps to the overall movement remains an open question. One first has to have a compatible device and software, then download the app (or subscribe to the right channel inside an app), then be in the correct location, then use the app, all before one can encounter the experience that the apps intend to convey. Someone who jumps through those hoops is likely to be someone already sympathetic to the cause–which means these may be the first real-world examples of AR’s tendency to entrench existing political divisions. Nevertheless, these examples do illustrate AR’s power to crowdsource a movement’s message. They allow individual artists located anywhere in the world to add their own spin on the group’s message–using different perspectives, images, and even languages–in a way that no mere physical demonstration could ever hope to accomplish. If even one of those protest “filters” catches on with a critical mass of individuals, it could change the entire course of the movement. This technique of spurring social change isn’t limited to protesters, either. The Dutch government recently used AR billboards as a form of experiential Public Service Announcement. The goal was to avoid a situation like one that occured in New York City, where passersby left a “homeless hero” to die in public after he saved a woman from a mugging. The billboard superimposed a violent criminal encounter over live video footage of the area where viewers stood. The onlookers could do nothing to interact with the scene or stop the crime. But they got a stark visual reminder of how appalling doing nothing can look. Just as Barack Obama proved in 2008 that social media could be an effective means of rallying support, so too are political parties beginning to discover AR’s potential value in political campaigns. The Green Party in Germany has partnered with Metaio to launch an app that lets constituents leave comments geo-tagged to specialized billboards and specific physical locations and that represent a certain issue–and to hear pre-recorded statements by party officials about those very issues. And just in time for the 2012 presidential campaign in the US, AR startup GoldRun recently announced a feature called “Visualize the Vote” that lets users pose for a picture with their favorite presidential candidate–super-imposed over the user’s physical location–then share that photo with their friends. As society grows more accustomed to engaging with customizable layers of reality, AR’s ability to affect social change will deepen exponentially. For example, GoldRun also plans to launch a location-based reminder service that automatically alerts you to a particular cause when you come within a certain distance of a related location. (Apple’s recently launched personal assistant Siri can do the same thing upon request.) The first example that has been mentioned is showing you the image of a dog or cat when you walk within a mile of an animal shelter. But this same technique could easily be applied to any social or political issue. Driving over a bridge might bring you a layer of information about the “pork barrel spending” that went into funding it. Entering a road construction area might prompt data on “your tax dollars at work,” or perhaps information about that company’s safety record. And whether a particular geotagged location sends you negatively or positively spun information could well depend on which political group’s channel you’ve already subscribed to–again reinforcing a tendency toward political groupthink. 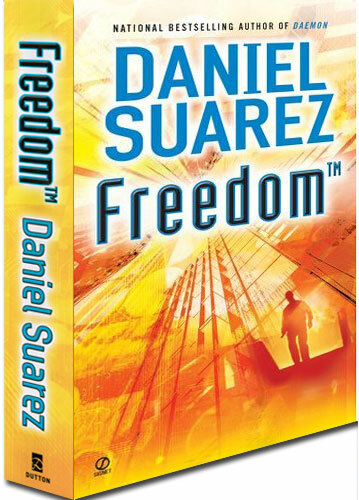 Perhaps the most radical vision of AR’s impact on society can be found in Daniel Suarez’s books Daemon and Freedom(TM). In that story, members of the AR-driven “Darknet” form a networked society that begins to subvert and supplant the existing political and economic order. Members of the community wear AR eyewear that allows them to see the information on which their Darknet society is based. All manner of virtual information like that described above is available to these people, except in a fully immersive, always-on manner. If someone writes a virtual protest sign on the side of a building, for example, that sign is equally visible to Darknet members as if it had been written with physical paint. But Suarez’s mediation on how AR would affect society goes deeper than virtual graffiti. Each of these people develop “reputation scores” that are visible to other Darknet members as numbers floating in midair above their heads. These scores are the cumulative averages of the “rating” that person has received from other Darknet members based on their credibility, honesty, proficiency, and the like. The higher that score–especially as the “base” number of ratings increases–the more trustworthy that individual is considered. It would be like living in a world where everyone judged you by your rating on eBay. Even more interesting is Suarez’s concept of the power meter. In addition to reputation scores, Darknet members achieve experience levels by accomplishing various tasks–exactly as in a video game. The higher one’s experience level, the more abilities they unlock within the Darknet, and the more data to which they gain access. In order to keep any one person or faction from gaining to much power over others in this way, however, all Darknet members are able to see not only the experience levels of others around them, but also the distribution of power within a given community. If power is concentrated in too few hands, the needle tips to the right. But if it’s dispersed too thinly–i.e., if there are no potential leaders within the group–the needle leans left. The optimal distribution of power is considered to be somewhere in between those extremes. In this way, Daniel Suarez posited a solution to the inequities protested by the Occupy movement well before that group existed. Question: How do you envision AR being used for political activism?